Halifax, NS – 18 July 2018 – DHX Media (or the “Company”) (TSX: DHX; NASDAQ: DHXM), a leading global children’s content and brands company, is gearing up for the premiere of the high-octane new animated series Mega Man: Fully Charged, an original co-production with Dentsu Entertainment USA, Inc. (“Dentsu Entertainment”). Starting Sunday, August 5, fans can tune in every Sunday to see Mega Man: Fully Charged on Cartoon Network in the US. Ten episodes will also be available on the Cartoon Network app and various TV providers’ VOD and on-demand streaming platforms in the US commencing Friday, August 3. Mega Man: Fully Charged, which is based on the legendary Capcom Mega Man video game franchise, will make its Canadian debut on DHX Television’s Family Channel in fall 2018. Man of Action Entertainment (Ben 10, Generator Rex, and the creators of the characters and team featured in Big Hero 6) serve as executive producers and story editors on the series. San Diego Comic-Con attendees will be among the first to get a peek at the all-new series during the Mega Man: Fully Charged panel taking place on Friday, July 20, 6 – 7 p.m. PT (San Diego Convention Centre – ​Room 25ABC). Along with an exclusive episode premiere from the series, the panel features Capcom’s Kazuhiro Tsuchiya (video game producer: ​Mega Man® 11, ​Asura’s Wrath™), Logan McPherson (DHX Studios, VP, creative & animated production: Slugterra, The Deep, Cloudy with a Chance of Meatballs, the series) and Man of Action Entertainment’s Joe Casey and Steven T. Seagle (executive producers and story editors: Mega Man: Fully Charged), who will provide a behind-the-scenes look into the creative process of reimagining this classic property for the next generation. In addition to the series’ launch on Cartoon Network and Family Channel, episode trailers for the new Mega Man: Fully Charged will be available on DHX Media’s YouTube-based kids’ network WildBrain. Beginning July 21, fans can check out clips and trailer previews on a weekly basis on the Mega Man: Fully Charged-dedicated YouTube channel. Fan interaction with Mega Man: Fully Charged will be action-packed off-screen as well, with the launch of the show’s consumer products hitting toy shelves in spring 2019. The upcoming line from master toy licensee JAKKS Pacific includes action figures, figurines, playsets and accessories, role-play items, and everyday dress-up and Halloween costumes. Created for kids 6 to 11, and their parents who grew up loving the video games, Mega Man: Fully Charged features exciting new technologies and robots, and the introduction of Mega Man’s alter-ego, Aki Light, a normal, upbeat, schoolboy robot with nano-core technology that allows him to transform into the mega-powered hero Mega Man! With his Mega Buster arm cannon and iconic helmet, Mega Man battles the wickedest villains Silicon City has to offer. Beloved characters, such as Mega Man’s robotic dog, Rush, will return – while new characters, like Mega Mini™ and Suna Light, will make their debut! The Mega Man® franchise is grounded in a series of popular video games, first launched in 1987 by Capcom, featuring battles fought by the eponymous blue robot hero and an ongoing cast of allies and enemies. Mega Man® has spawned over 136 video games on multiple gaming systems, selling over 32 million copies worldwide, as well as a plethora of toys, comics and collectibles. Capcom is releasing the highly anticipated sequel, Mega Man 11, coming to home consoles on October 2, 2018. A highly rated Mega Man TV series was popular in the USA in the mid-1990s and aired on ABC Family. Distribution and licensing rights worldwide, excluding Asia, for the new Mega Man: Fully Charged series are managed by DHX Media. Dentsu Entertainment manages distribution and licensing in Asia. DHX Media Ltd. (TSX: DHX; NASDAQ: DHXM) is a leading children’s content and brands company, recognized globally for such high-profile properties as Peanuts, Teletubbies, Strawberry Shortcake, Caillou, Inspector Gadget, and the acclaimed Degrassi franchise. One of the world’s foremost producers of children’s shows, DHX Media owns the world’s largest independent library of children’s content, at 13,000 half-hours. It licenses its content to broadcasters and streaming services worldwide and generates royalties through its global consumer products program. Through its subsidiary, WildBrain, DHX Media operates one of the largest networks of children’s channels on YouTube. Headquartered in Canada, DHX Media has offices worldwide. Visit us at www.dhxmedia.com. About Dentsu Entertainment USA, Inc.
Man of Action Entertainment are Joe Casey, Joe Kelly, Duncan Rouleau and Steven T. Seagle, the writers’ collective behind comic’s largest franchise characters as well as original characters published by their imprint at Image Comics. Their creations include Ben 10, the $4.5 billion boys’ action franchise for which they’re executive producing a new iteration, and Generator Rex, both for Cartoon Network. 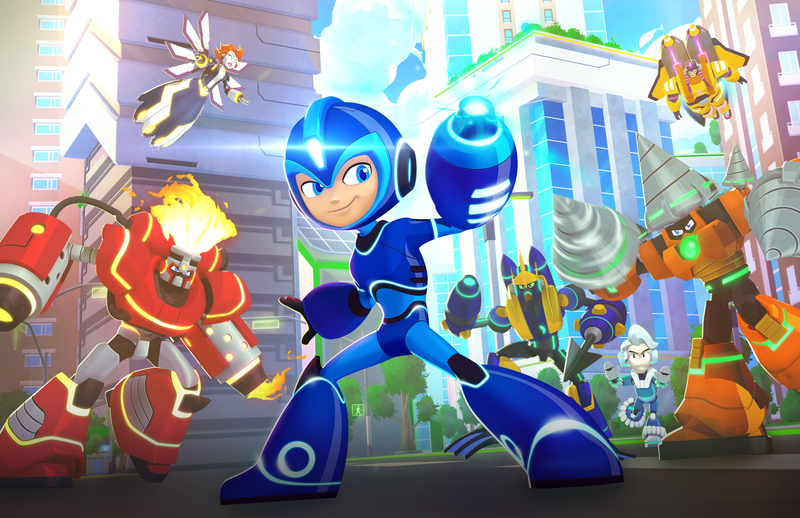 Dentsu handpicked them to create, write and executive produce the all-new Mega Man series. They also launched Disney XD’s Marvel’s Ultimate Spider-Man and Marvel’s Avengers Assemble as EXP/writers. Man of Action created the characters and team featured in Big Hero 6, Disney/Marvel’s Academy Award®-winning feature. In addition to creating successful video games, toy lines and comic books, Man of Action are the creator/producer/writers of current and upcoming feature films and live-action TV series based on their original comic books and graphic novels including I Kill Giants, Officer Downe, Kafka, The Crusades and The Great Unknown. Capcom is a leading worldwide developer, publisher and distributor of interactive entertainment for game consoles, PCs, handheld and wireless devices. Founded in 1983, the company has created hundreds of games including ground-breaking franchises Resident Evil®, Street Fighter®, Monster Hunter™, Ace Attorney®, Mega Man® and Devil May Cry®. Capcom maintains operations in the U.S., Canada, U.K., France, Germany, Tokyo, Taiwan, Hong Kong and Korea, with corporate headquarters located in Osaka, Japan. More information about Capcom and its products can be found at www.capcom.com or www.capcom-unity.com. Capcom, the Capcom logo, Ace Attorney, Devil May Cry, Mega Man, Monster Hunter, Asura’s Wrath and Resident Evil are either registered trademarks or trademarks of Capcom Co., Ltd., in the U.S. or other countries. Street Fighter is a registered trademark of Capcom U.S.A., Inc. This press release contains “forward-looking statements” under applicable securities laws with respect to DHX Media including, without limitation, statements regarding the timing and availability of Mega Man content and the business strategies and operational activities of DHX Media. Although the Company believes that the expectations reflected in such forward-looking statements are reasonable, such statements involve risks and uncertainties and are based on information currently available to the Company. Actual results or events may differ materially from those expressed or implied by such forward-looking statements. Factors that could cause actual results or events to differ materially from current expectations, among other things, include risks related to production delivery and scheduling, the ability of DHX Media to execute on license agreements and the risk factors discussed in materials filed with applicable securities regulatory authorities from time to time including matters discussed under “Risk Factors” in the Company’s most recent Annual Information Form and annual Management Discussion and Analysis, which also form part of the Company’s annual report on Form 40-F filed with the U.S. Securities and Exchange Commission. These forward-looking statements are made as of the date hereof, and the Company assumes no obligation to update or revise them to reflect new events or circumstances, except as required by law.